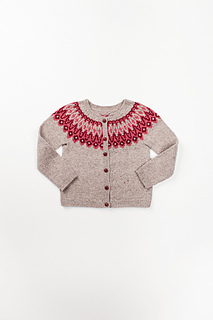 Warm a dauntless Viking adventurer or a treasure hunter in search of seaboard flotsam with a light, cozy fabric of Loft. 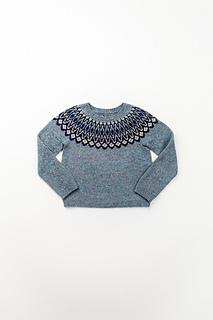 Atlas features a bold Icelandic-inspired motif about the circular yoke. The deep chevrons require the use of three colors on some rounds, so this pattern is most suited for knitters with some colorwork experience. 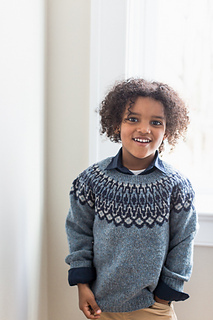 The pullover is worked in the round from the bottom up with polished details like tubular edging and short rows for a comfortable fit. 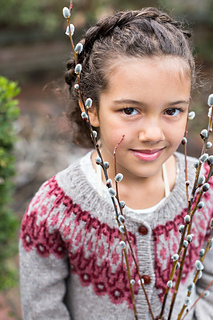 Make it a cardigan by adding stitches for a steek and cutting the fabric open after the body is complete. 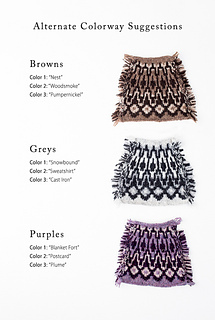 (Thorough instructions in the pattern guide you through the process if you’ve never made a cardigan this way.) Consider letting the child choose the colors—one light, one dark, and one medium shade from the Loft palette will work in almost any combination. 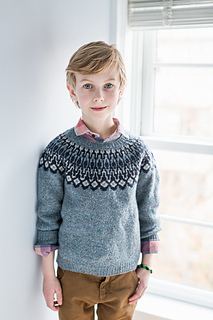 Knit your Atlas in time for late summer evenings at the fair or to brighten crisp morning walks to school. 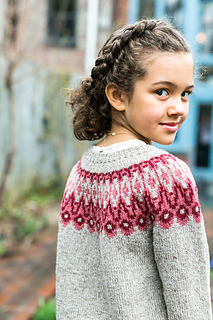 Please note: the colorwork patterns in this garment are charted only.